Read your meter left to right, like an odometer on a car. Understand the numbers on the “odometer”. The white numbers on the “odometer” measure water in hundred cubic feet. You are only billed for every 100 cubic feet, or 1 CCF, of water you use. 1 CCF = 748 gallons. The numbers in black measure in units smaller than hundred cubic feet. The two black numbers on the dial are not used for billing purposes but are helpful in measuring smaller water usage or leaks. So if you do frequent checks and want to take a deeper dive into your water usage, it may be worth keeping track of the black numbers as well. Read your meter regularly to check for costly leaks. Leaks are the worst kind of water expense because they come with all of the costs and none of the benefits. To check for a leak, turn off all of the water to your house and take a meter reading, then wait 15 to 20 minutes and take another. Don’t forget to use the sweep hand on the meter, too. One revolution of the sweep hand equals 7.48 gallons (one cubic foot). If the sweep hand has moved or the numbers have gone up, you have a leak that needs to be addressed. Use your meter to gain key insights. You can get a better picture of how common tasks, such as plant irrigation, affect your water usage by taking a reading before and after each task. You can also take a reading at the beginning and end of a week to see how much water you use on average per week. Those numbers can be multiplied out to extrapolate how much water you use on a specific task per month, or how much water you might expect to use all month, helping you to make adjustments or to estimate your water bill and budget – your money or your water – accordingly. If you’re still unsure of how best to read your meter, consider taking some time to observe how an SJW employee does it during their next visit. SJW meter reads have a 99.85% accuracy rating across 1.5 million reads per year. SJW meter readers are incredibly hard-working and efficient, too, often walking 6 to 10 miles per day in the course of their duties. Our 15 meter readers service 230,000 meters that are read either monthly or bimonthly. 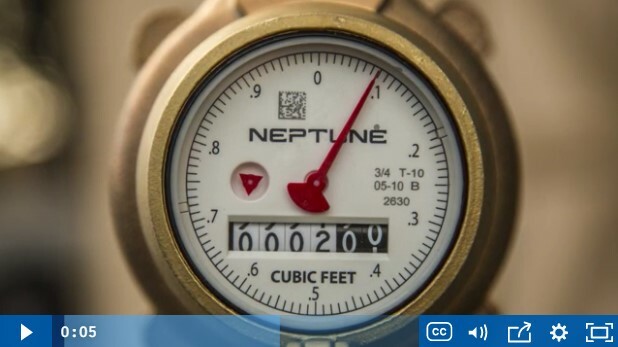 Want to learn more about reading your water meter? Watch this helpful video.